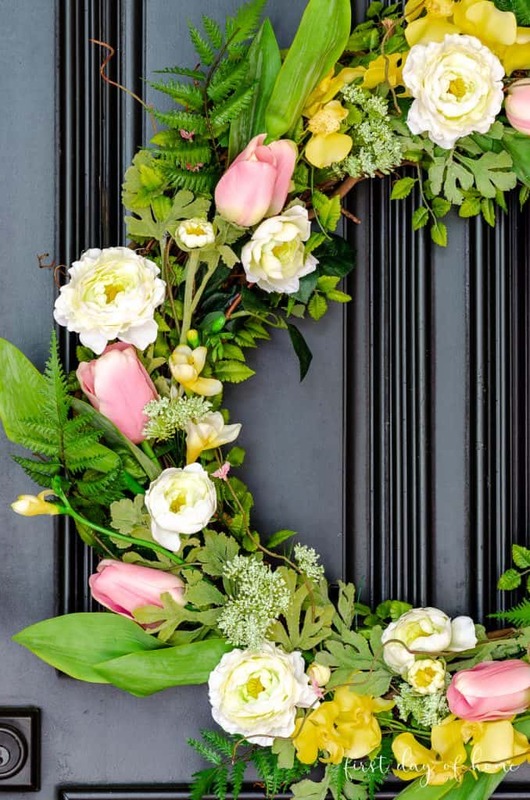 If you’re into making DIY spring wreaths, you’ve probably faced the challenge of keeping your artificial flowers looking fresh. 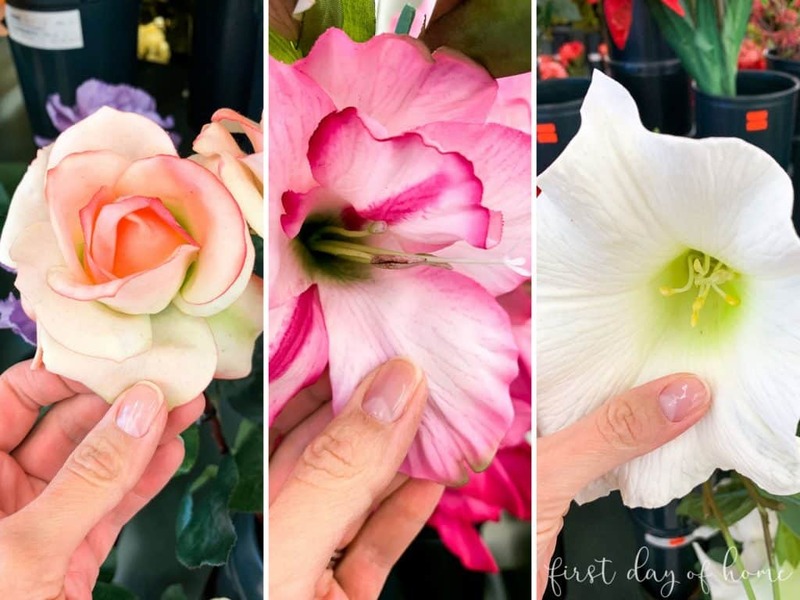 This year, my faux florals went from fab to drab after just one season! 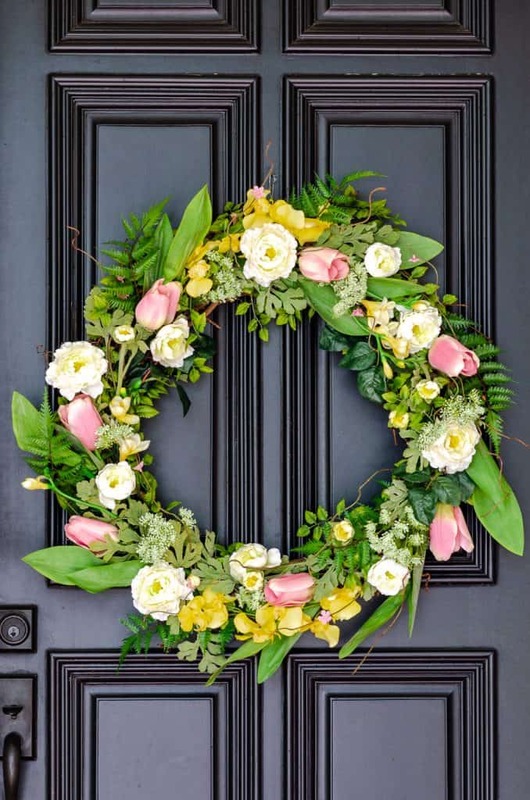 Today, I’m sharing my thoughts on how to get the best looking spring wreath for a front door. 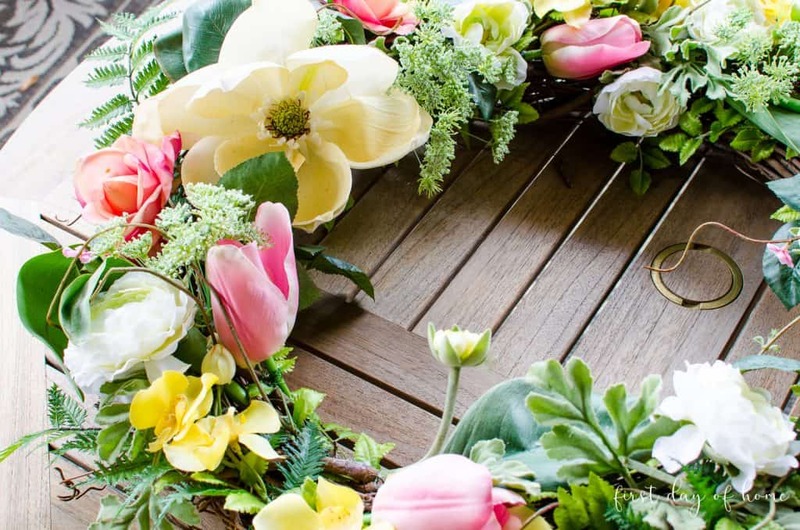 With these tips, you won’t waste time buying a new crop of artificial flowers every year. 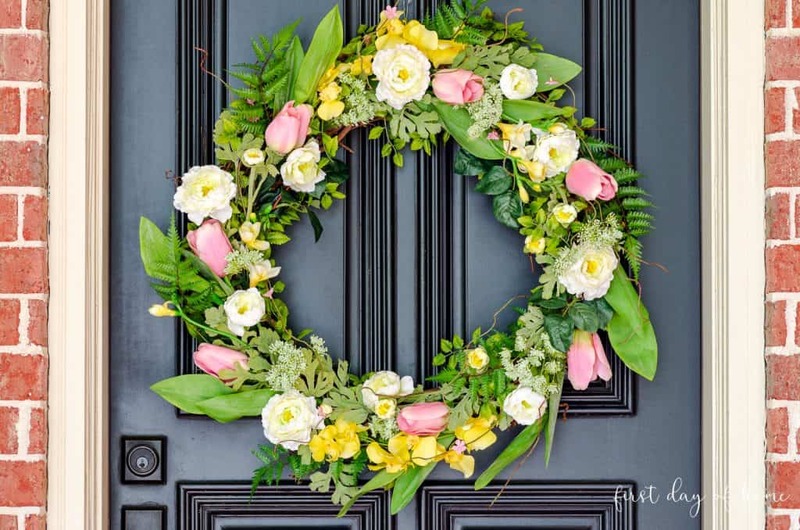 To keep your spring wreath looking stunning throughout the years, I have a few tips you should follow. 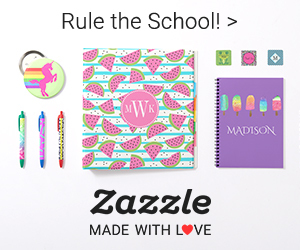 The big retailers won’t like me sharing these secrets with you, so let’s just keep these among friends, okay? 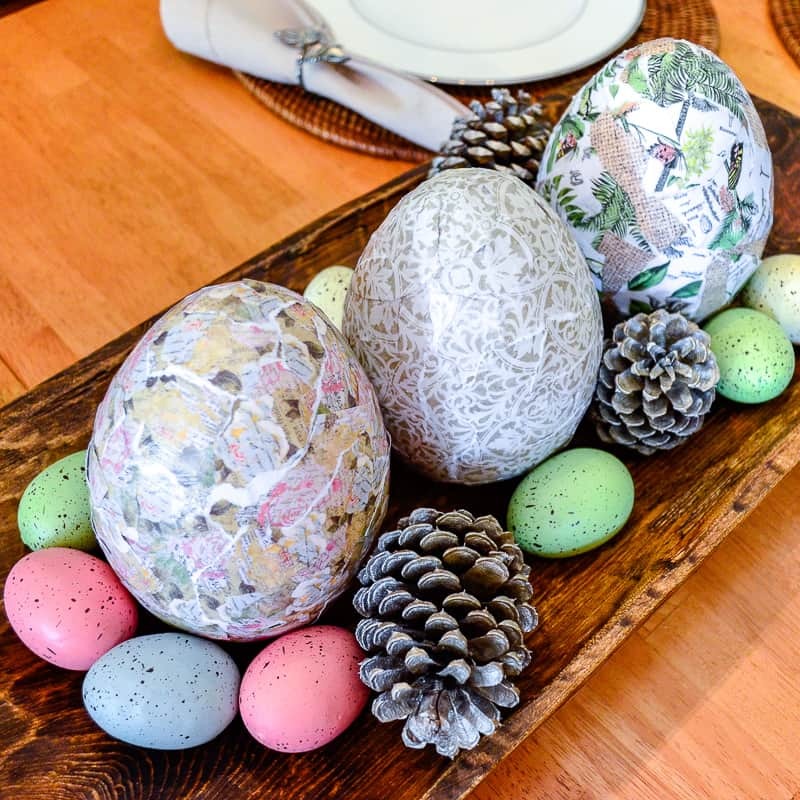 As pretty as some faux florals are, not all were meant for the great outdoors. After testing several varieties over the course of many years, I can happily make some recommendations. 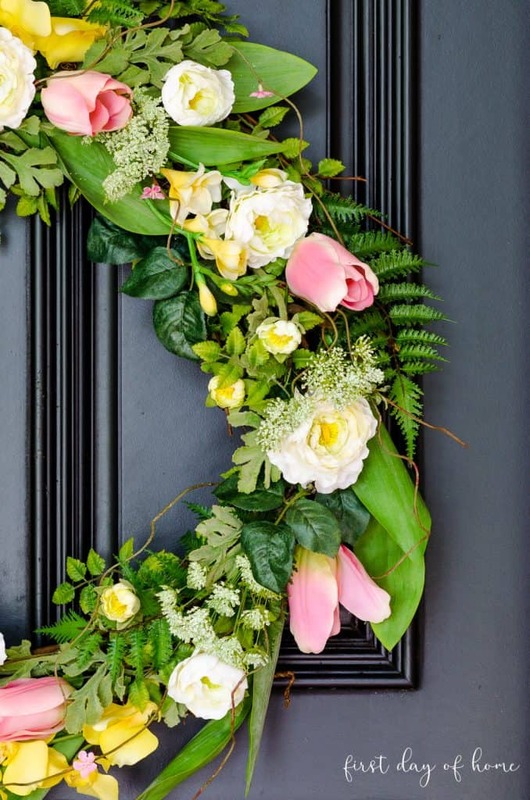 I bought these artificial flowers for my spring wreath makeover last year. As you’ll see later on, some of these lasted and some didn’t! 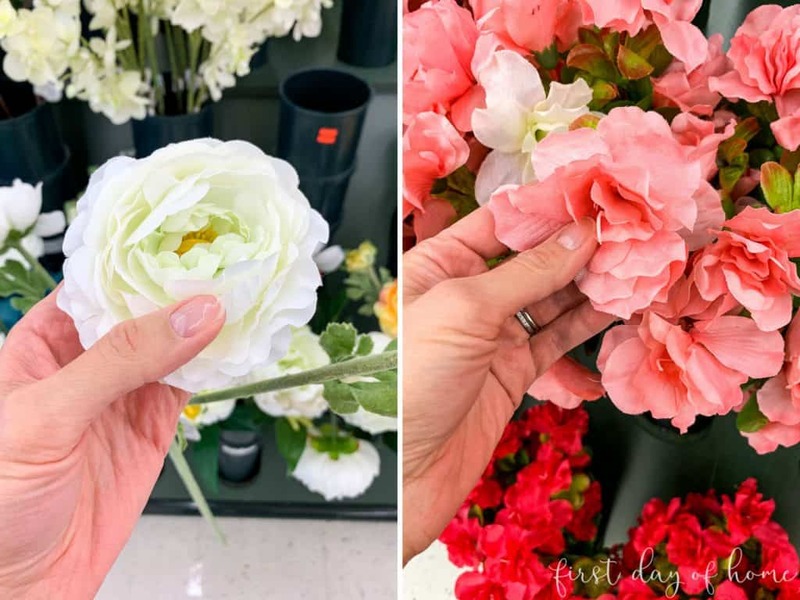 Here’s what to look for when deciding which outdoor artificial flowers to buy (or not buy). This may sound obvious, but the more your outdoor plants and flowers are exposed to the elements, the worse they will look. If you can’t avoid some spring showers, try using WD-40 to protect the petals and leaves from moisture and sunlight. I prefer a non-aerosol spray like the one below. …however, many of the white blooms had turned an ugly shade of yellow. Blegh! Other flowers in my wreath just needed a good spring cleaning. 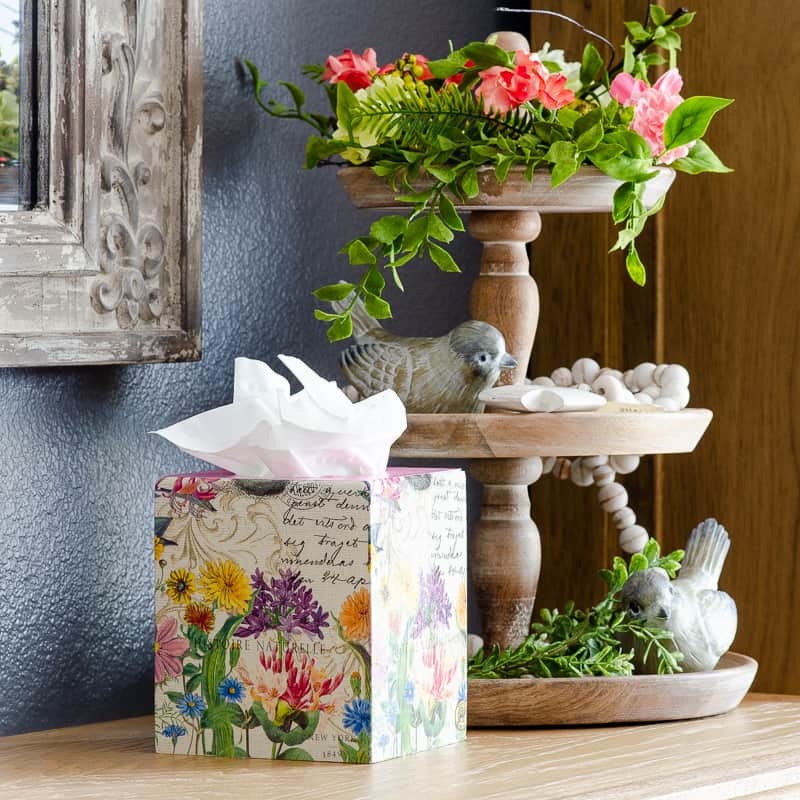 I’ve read many different approaches to cleaning faux flowers and plants. After a week of experimenting, I’m here to give you the low down. Are you ready? 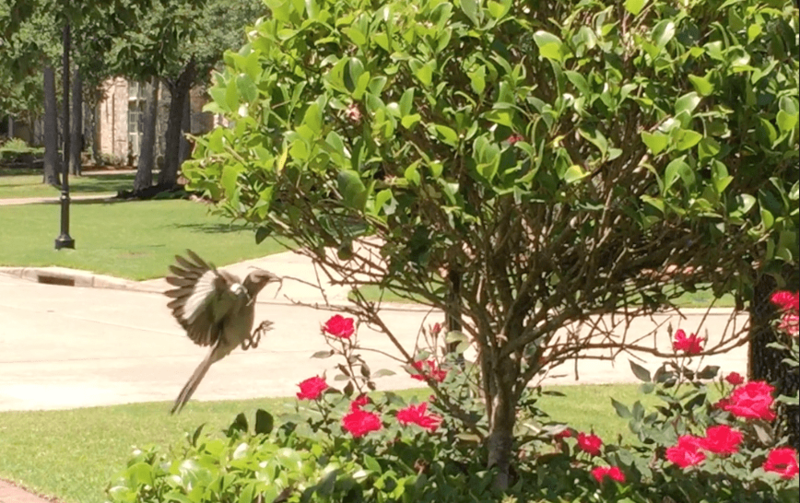 Some flowers, like the magnolias and roses, were damaged beyond repair because I didn’t follow tip #1. They were never meant to be outside! You’ll notice the yellow hue present on both flowers, even after cleaning. Other florals, like tulips, orchids, freesia and white ranunculus, looked brand spanking new after a little cleanup. So how did I clean them? 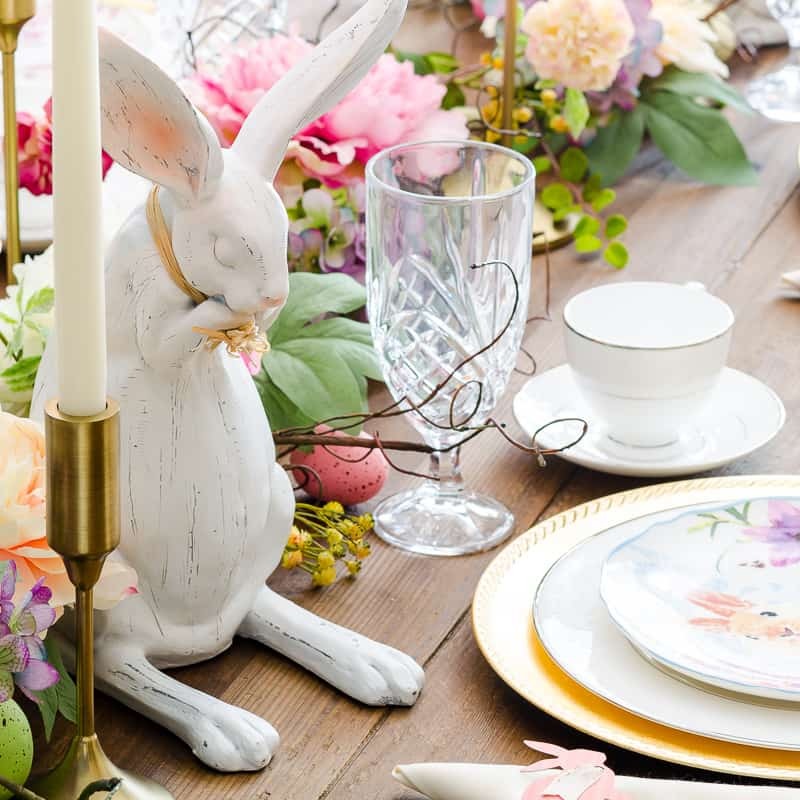 If you don’t have great looking faux florals after following these steps, it might be time to replace them. This is now my go-to method for cleaning all of my indoor and outdoor plants. If you don’t have access to the plant spray, you can try using a mild dish detergent with a wet cloth instead. While the cleaning spray won’t bring back the original color of a flower that has turned yellow, it does a great job cleaning dirt and grime. 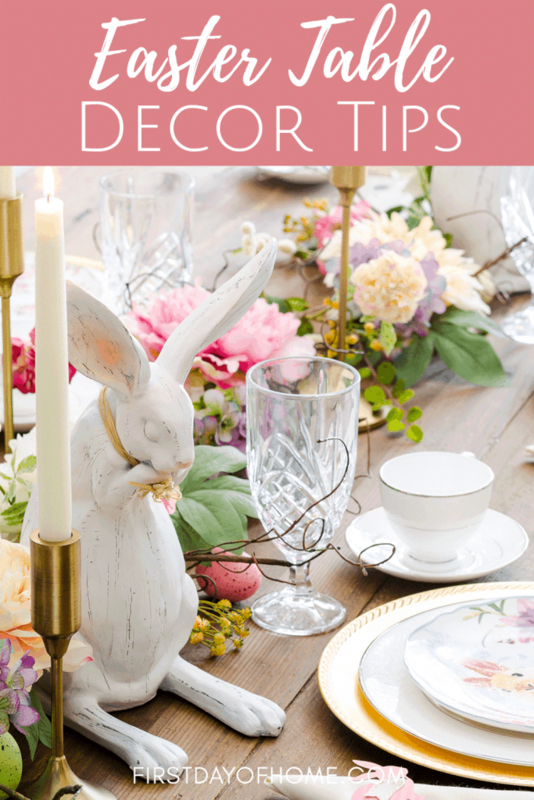 I tried a few other recommendations to clean my flowers, but all of these had drawbacks. 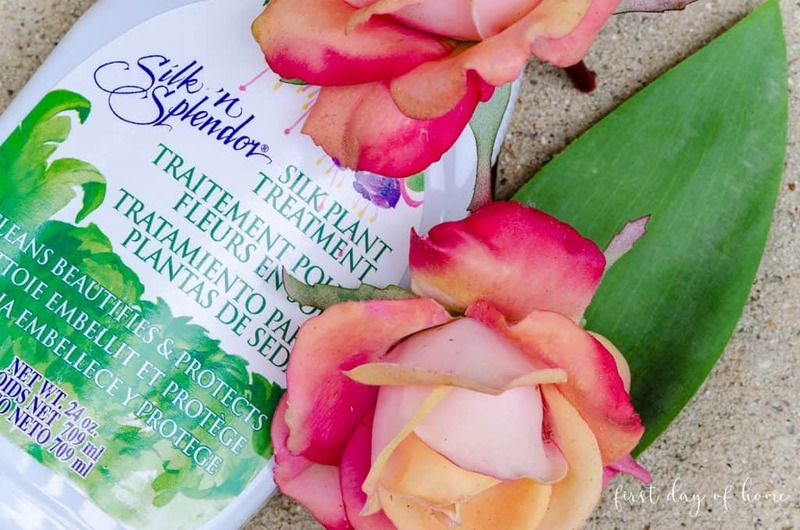 Cleaning silk flowers in a bag of salt or rice – I don’t have enough of these ingredients to spare. (Does anyone?) I wasn’t impressed with the results when I tested this option anyway. 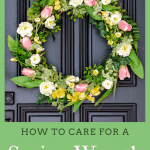 Spraying flowers with a mixture of vinegar and water – This works well for greenery and non-floral outdoor plants. With flowers, you risk removing the dye from colored petals. 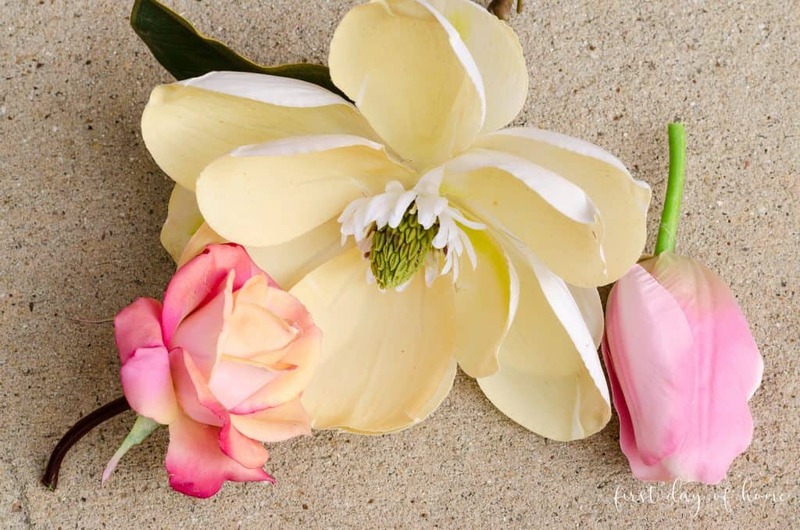 Cleaning flowers with hair dryer on low setting – This option works best to remove loose dust only (not grime). Beware of applying too much heat if you used hot glue on your wreath. 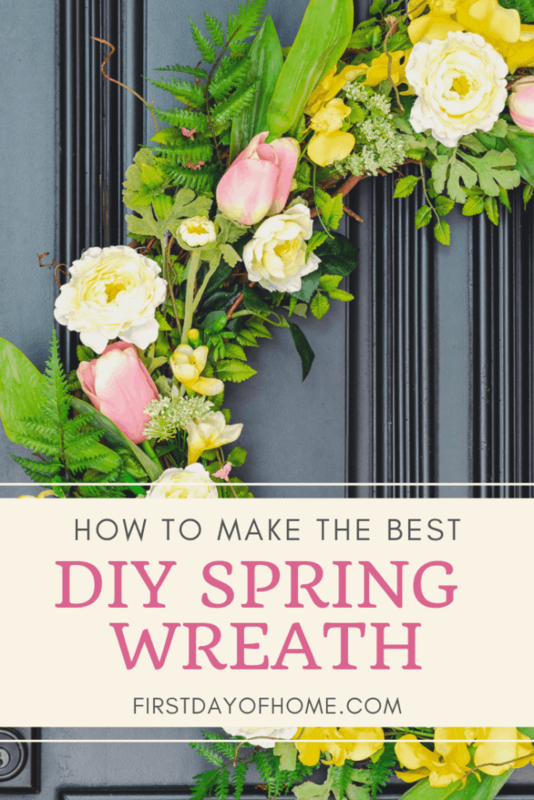 When making a DIY wreath, especially a grapevine wreath, I like to use both floral wire and hot glue. 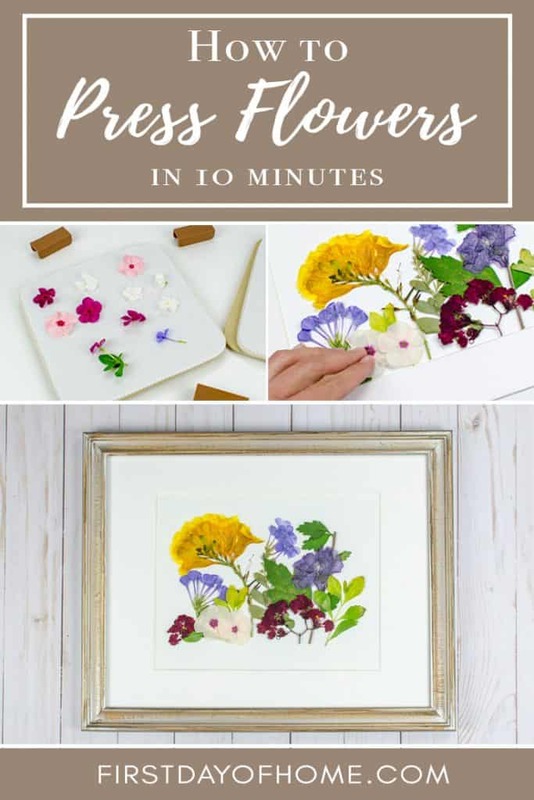 The floral wire allows me rearrange stems when making my flower arrangement. Plus, it tends to hold stems in place more securely than hot glue. 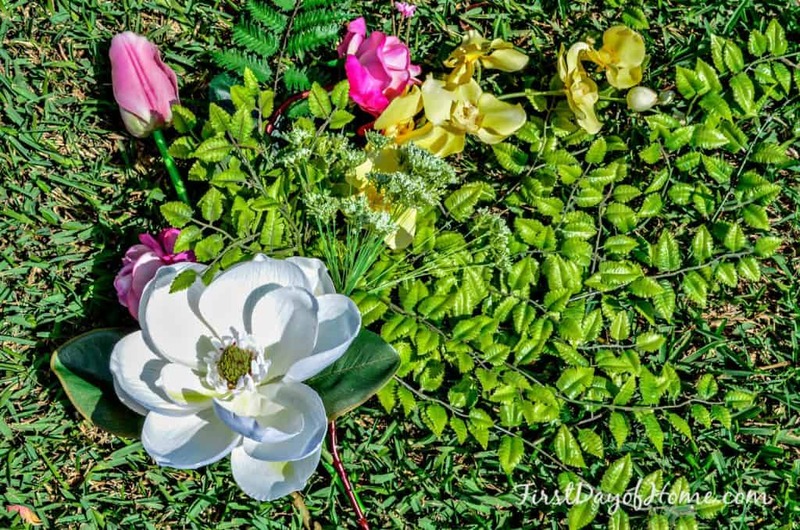 This approach comes in handy when you have to toss out big magnolia blooms and substitute other flowers like I did! Glue helps to attach lighter items to your wreath, like leaves and foliage. It can also tame some of the more stubborn petals. If there’s one thing I’ve learned about making a spring wreath for the front door, it’s that all types of creatures find it attractive. 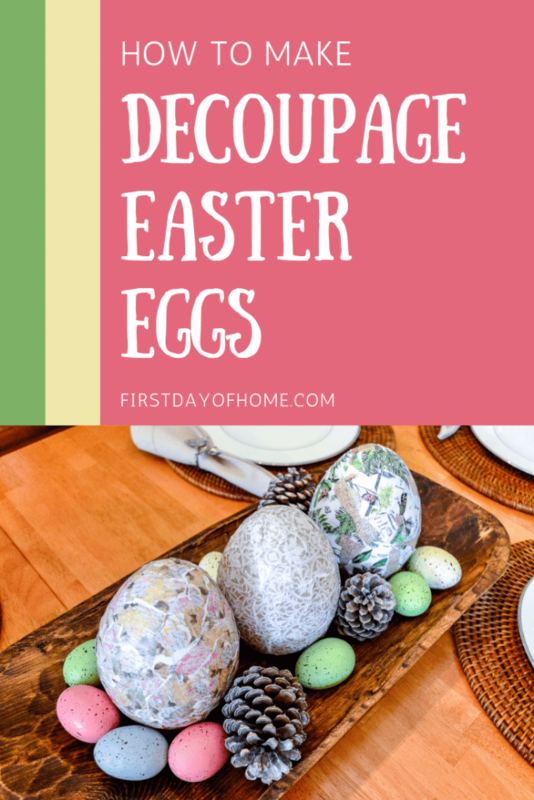 We’ve seen everything from mud daubers to birds trying to make a home in my wreaths. The occasional spider web is also par for the course. Many pest control services will sell chemical sprays to deter these pests. No, thank you. I like to use natural remedies to protect my wreath whenever possible. I recently learned that small particles of dirt and debris can cause white fabrics to develop stains over time in storage. The same is true for artificial flowers. 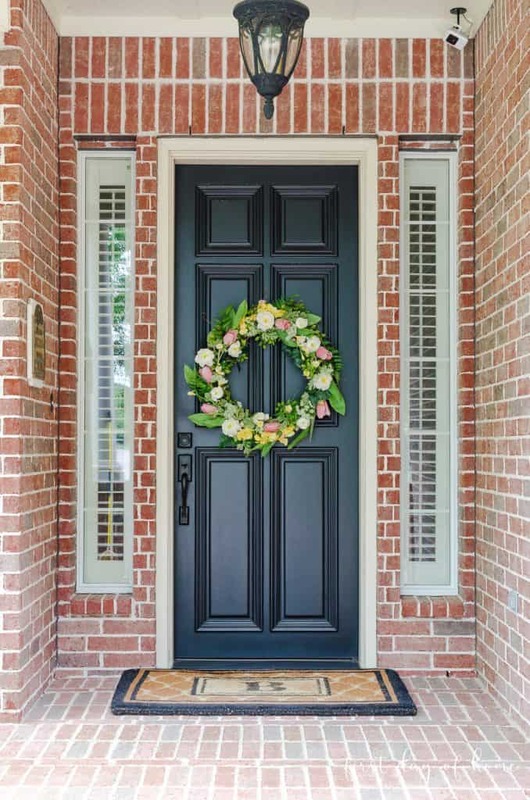 You can use the cleaning techniques above to fully clean your wreath before it goes into hibernation. If you store your wreath in a plastic garbage bag, prepare for the disappointment of yellowing flowers. These plastics may emit gases or other chemicals that can harm your precious florals. I’ve had this happen to eucalyptus garlands and other floral arrangements, even when stored in an air conditioned closet. For better protection, use a wreath storage bag made for this purpose. Here are some of my favorite options. I’m very pleased with my updated front door wreath this year. I’m even more thrilled that I’ve now learned my lesson on picking the right supplies. 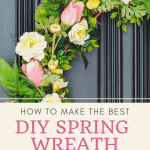 I hope you’ll enjoy making your own spring wreath that lasts for years to come! 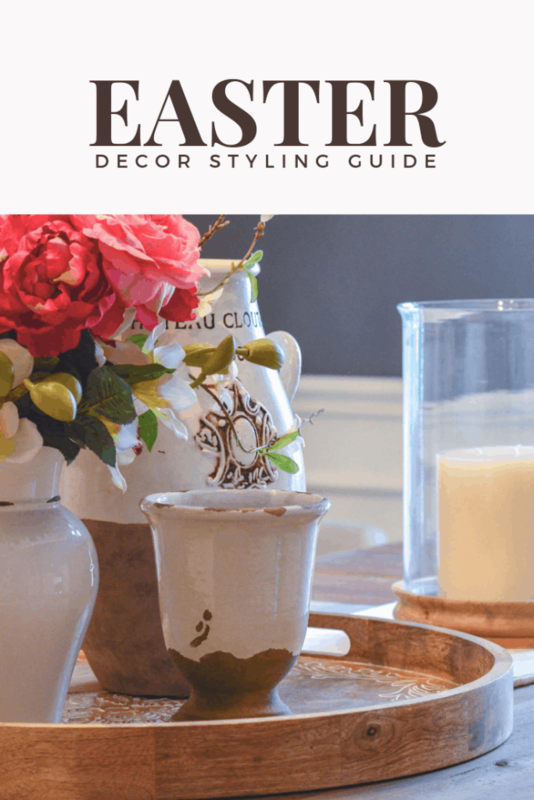 Please pin it for later, and don’t forget to check out my Spring Decor board on Pinterest for more spring wreath ideas! I love the wreath and needed the tips. I threw out a wreath I think I could have refreshed a bit. Now I know exactly what to look for, thank you. Good tutorial! I’ve had wreaths that were destroyed by the sunlight that hits my front door! Thanks, Lauren! Yes, it’s hard to keep them looking good, especially in harsh climates. We get so much humidity here, so I have to learn all of these tricks! So much helpful information Crissy! I am terrible at making wreaths even though I love them! Yours makes your entryway so welcoming😊 I have never heard of using WD 40 to protect the florals! Thanks for sharing and I will pin! Thanks so much, Cindy! 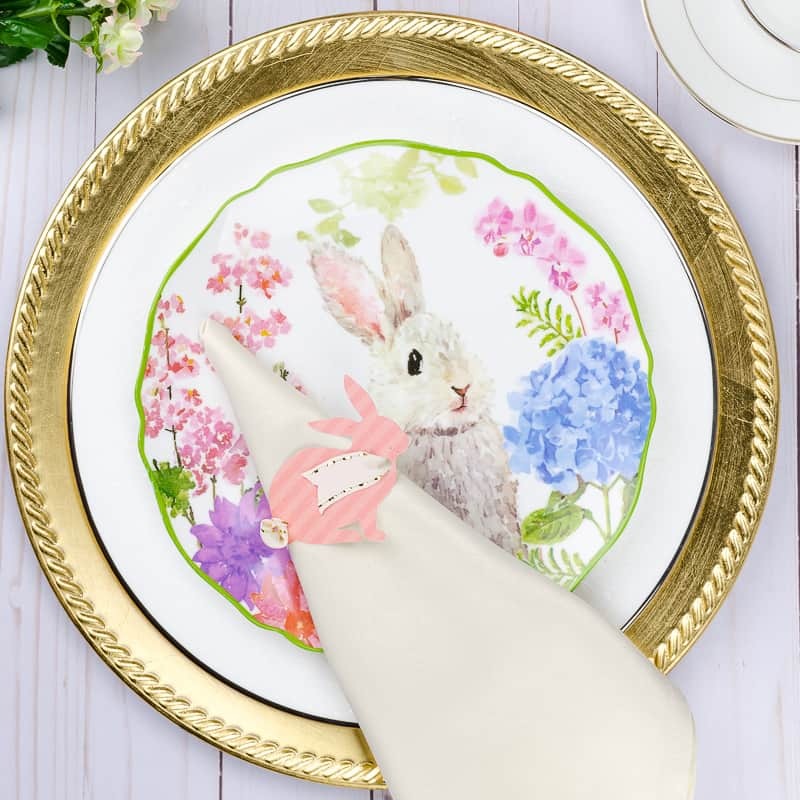 After seeing your amazing restoration work, I’m sure you could make a gorgeous wreath. I’m glad you found the tips useful, and I appreciate you pinning! This is a lovely wreath. And your tips are WONDERFUL! It’s funny… I’ve seen your ‘yellowed’ roses in several pics now (on your social medias outlets). And each time I think, “That’s so pretty and looks so real”. LOL! I think the yellowing, at least in the photos, make it look for natural (I’m sure I’ve seen a similar true variety of those colors). BTW, for year now I’ve use the salt trick for dusting my faux florals. It works like a dream for dusting, but definitely doesn’t give them a good washing. 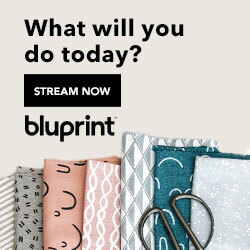 Your tips on washing and protecting are GREAT! Thanks, Julie! Well, you’re probably seeing old photos from before my roses turned yellow. Ha! Yes, the roses still look usable and have a more vintage effect. The magnolias, however, looked very aged. I couldn’t find a good use for those once they turned. I do like the salt trick for small individual stems, but the spray I found worked wonders when I didn’t want to take apart my wreath. I just sprayed the whole thing and let it drain outside. Thanks for the great comment!